The finest, highest uniform grit sanding discs available! Finishing out with 2000 grit wet/dry sandpaper was once considered finishing out with a high grit paper! The advent of 3000 grit and then 4000 grit sandpapers changed the way professionals finished out a sanding job. 3M is once again rewriting the standard with the introduction of 5000 Grit Ultra Fine Finishing Discs! The sanding mark pattern left after sanding with 3M Trizact 5000 Discs is so refined, that you can actually see reflections in the sanded areas! Normally paint that has been sanded is flat and dull, but when finishing out with 3M Trizact 5000 discs you’ll already be working towards the goal of restoring a clear, glossy finish. These ultra fine cut finishing discs are made from a Silicon Carbide Mineral embedded in a cured resin medium on a flexible film. The polyurethane foam backing is designed for wet use. 3M Trizact 5000 Discs should only be used with water for both machine and hand sanding. These dampsanding discs are designed for use in body shops on fresh paint. 3M Trizact 5000 Discs intended for refining P3000 Grit Sanding Marks to an even more shallow level. This makes it faster and easier to remove any remaining sanding marks by compounding or polishing. Pro and enthusiast detailers can use the 5000 grit foam backed sanding discs to level surface texture, orange peel and deeper swirls and scratches. The sanding mark pattern left behind is easy to buff out of even the hardest, factory baked on paints by simply compound or polishing. With the 3M 5000 foam sanding discs it is completely possible to remove the sanding marks by only using a polish. Several factors that will determine whether this is practical include, paint hardness, brand of paint and age of paint. To determine if a polish will be sufficient, polish a small test section after sanding and inspect the results. If polish is not aggressive or effective enough to remove all of the sanding marks in a timely manner, then you may need to use a compound. In most cases, after sanding with 3M Trizact 5000Foam Discs the aggressive cut of a wool pad is not necessary. Simply use a foam pad with a polish or compound to remove the sanding marks. By using foam instead of wool, you can reduce the amount and depth of the swirls left in the paint. 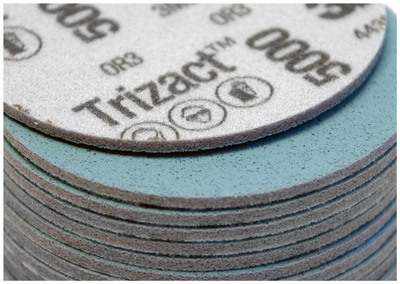 3M Trizact 5000 Discs are designed to be used with water for dampsanding. These sanding discs are not for dry sanding. 3M Trizact 5000 Discs are for dampsanding. Dampsanding uses less water than traditional wet sanding. Normally a few sprays of water from a spray bottle is more than enough for proper sanding performance. As an option, you can use a little soap to help lubricate the surface and break the surface tension between the water and the paint surface. A little soap can also help prevent the sanding side from clogging up with removed paint particles. For best results, use 3M Trizact 5000 Discs with a DA Sander that has an orbit stroke of 3/16” or higher. Smaller orbit strokes, like 3/32”, do not allow the Trizact abrasives to properly cut. Larger orbit tools help finish the job quickly and allow the abrasives to completely refine the previous sanding marks. Use of a foam interface pad between the sanding disc and the backing plate is recommended. The foam interface pad makes machine sanding smoother for the technician and enables the sanding disc to conform better to curved body panels. Using an interface pad also reduces the aggressiveness of the sanding action and reduces the chance of creating coarser scratches. For best results, 3M Trizact 5000 Discs should be used with a machine. This ensures faster, more uniform results. However, if machine sanding is no an option, 3M Trizact 5000 Discs can be used by hand. 3M Trizact 5000 Discs can be used to remove swirls, scratches and oxidation when restoring neglected cars. Yes. Working on Ceramiclear paints requires extra care but 3M Trizact 5000 Discs can be used on these hi tech paints. Also available in 3" and 5" sizes.